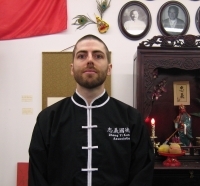 Andrew began his study of Chinese martial arts in 2003 with Yang and Chen Taiji Quan and Chang Quan (Wushu). He has studied Bei Shaolinquan with Shifu Ferreira since 2006 and competes on both the Lei Tai and Taolu Teams. Andrew is a personal trainer and teaches the Strength and Conditioning class at ZYKFA. He became a ZYKFA certified Instructor in 2010. Andrew became a champion in Lei Tai fighting at the 2011 UMAI Kung Fu Championships.